The Facilitator’s manual includes a half day and a full day workshop outline to make it easier for the trainer to deliver workshops of varied length. Each topic is introduced with background concepts and there are notes for leading discussions and detailed instructions for leading participants through experiential exercises. The trainer uses a PowerPoint slideshow to pace the workshop and summarize key learning points. Create ownership and responsibility to lead by considering individual performance needs. Improve sensitivity to a wider range of effective leadership actions. Learn individual tendencies in a variety of management situations. Learn to make the strategic decision preceding virtually every supervisory action to influence performance by emphasizing the “task” or the “people”. Recognize the strengths and weaknesses of your dominant style. Learn to flex your style appropriately to the needs of the direct report. Effectively use the Instruct, Relate, Coach, and Delegate styles. View performance situations in terms of how capable the employee is and how strongly they desire to perform well. Master 3 simple steps that can be applied in all performance management situations. Plan your use of strategic leadership back on the job. Integrate an employee development strategy into the use of strategic leadership styles. Trainers/Management instructors will benefit from a holistic explanation of management science culminating in the author’s development of the Strategic Leader model. This appendix discusses early management research at Ohio State University and by Blake/Mouton and Hersey/Blanchard which resulted in the first managerial grids. It goes on to discuss flaws widely recognized in these management concepts, and then explains how the Strategic Leadership model ameliorates and overcomes these criticisms by its incorporation of tactical flexibility within a strategic position. 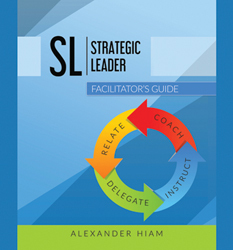 Use this Facilitator’s Guide with the Participant Coursebook and the online assessment or paper/pencil, self scoring assessment for a complete leadership workshop.